Good trip w/congenial small group in a van. 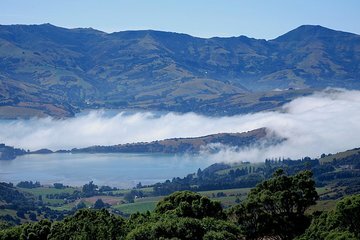 Gorgeous scenery on the Banks Peninsula! My cafe lunch was good and sufficient portions for another meal. My only suggestion is that mid-morning tea break w/good brownies would be better taken earlier and not a half hour before lunch. Driver/Guide Peter, friendly and helpful, probably wanted a table to use such as the one outside at the Cheese place Not a real tasting event there just small samples of their products offered at the inside counter, and he was running late due to morning traffic in the city, but there must be someplace else that would work for an earlier stop. I'd vote for roadside looking down upon Lyttleton Harbour, where we didn't get to stop because Akaroa Harbour is even more beautiful. Two beautiful harbours are not too much to stop, see, and sip. Not many porpoises t'other day because the captain didn't want to take the boat out too far too many pax earlier in the day had been seasick. We did see several though. This cruise was much better value than the one in Dunedin off the Otago Peninsula days earlier. That one was v. short, and we saw more albatrosses from the Hide on the headlands. Very good scenic tour and the guide was great. The Eco Marine tour is not for everyone because the boat goes extremely close to the rocks and can be unnerving but it was a good tour. Excellent tour with lots of interesting places to visit and see. Tour guide was excellent. Well worth seeing!! I appreciate the small groups with lots of interaction with tour guide and other participants. Great trip. John, my guide was very friendly and seemed to know everything about the flora and fauna that we came across on the trip. it was very well planned and gives you a chance to get out of the city and see more of the countryside. the sights on the cruise were incredible. Fantastic! Loved everything about the tour, except perhaps the sea sickness. A really enjoyable and memorable day! Would recommend to anyone.